FWOOOOOOT! That is the sound of the whoopee cushion. It is at once, base, childish, uncomfortable, and yet, laugh-inducing most-every time. Oh, sure! There are sticks in the mud. Fuddy-duddies who pretend not to notice when they hear "such a sound" as that of the inimitable whoopee cushion. Let us proceed through this article as though "those people" do not exist. Let us look at the best items to wear the name "whoopee cushion"! 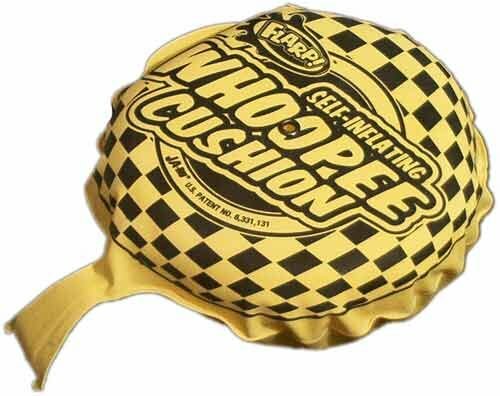 That it took humanity decades of the whoopee cushion's existence to figure out a way to inflate the "dirty" whoopee cushion without putting one's mouth to it every time is kind of amazing. We are smarter than all that! 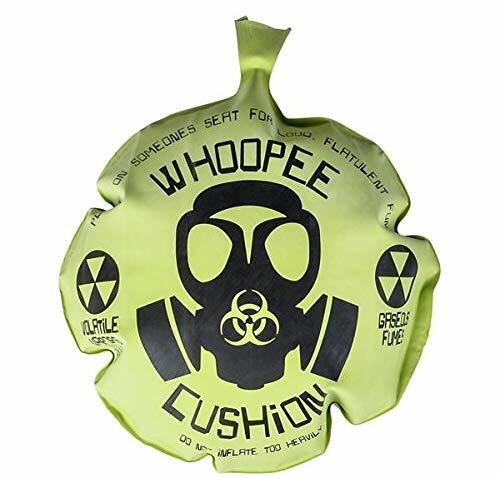 Yet, the "regular" whoopee cushion was around seemingly "forever" before this baby came into my life. The first time I saw one in the late 90s, I knew it was for me! Inside this modified whoopee cushion rests a resilient piece of foam that refills the cushion with air (thanks to an intake hole) each time the cushion is pressed and then released. 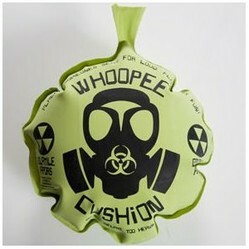 If you seek a great, durable whoopee cushion, this one is a must! Want a bigger explosion? Get a bigger "bomb". Such is the "logic" behind the 17-inch Mega Whoopee Cushion. Imagine the "whoopees" you will make with this beauty! The bigger the "whoopee", the bigger the laughs! Thus, the existence of Play Visions' plushies. Who would not want to make "whoopees" with a plushy? Thanks to Play Visions, you can buy your child (or yourself -- you big kid!) 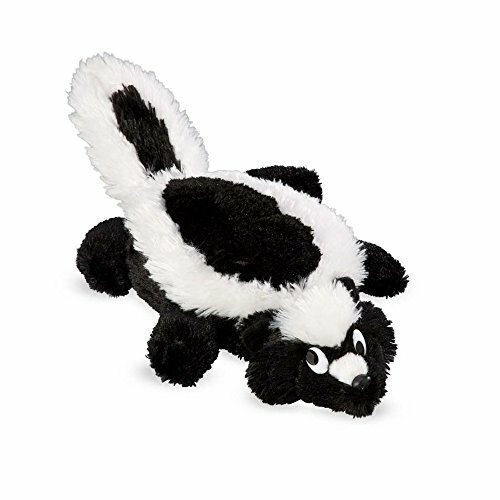 a stuffed animal with a big "surprise" inside -- a whoopee cushion inside the plush! At the most, whoopee cushions are rubber and foam (if self-inflating). At the least, they are just cheap rubber. As a result, these are not long-lived products -- but who expects something that unleashes such "joy" to last forever? Be prepared for your whoopee cushion to wear out over time. Do not worry though, the makers of whoopee cushions will be happy to sell you another! Who am I kidding! No time is the wrong time, and no place is the wrong place for a good whoopee "cushioning"! Brenda! I'm with you! I've got to have it, too! Okay Regi, I've got to have that Pooter cushion. Thanks for the love, kinworm! Ha ha, I loved reading your list about what Whoopee cushions are not meant for! We had lots of fun with these as kids - it's healthy to have a good laugh and a raspberry sound is just funny. I love funny bandaids - I think it started many, many decades ago, just loving to pick a bandaid size from the vintage tin container. Now I can even have bacon or pickle bandages!